Movie stars enjoy tremendous fan following. Apart from the ordinary fans, some stars will have celebrity fans. When a celibrities show their liking towards a star, it grabs the attention of everybody. 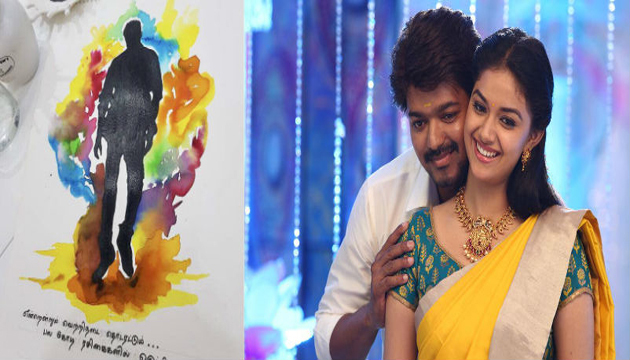 In a recent development Keerthy Suresh has hit the news headlines with her fondness towards her favourite star. It is known that Keerthy Suresh became a busy heroine in South with several crazy offers. She has great demand and she enjoys huge fanbase. But she is a huge fan of Tamil star hero Vijay. She has recently planned a surprise birthday gift to Vijay as he has celebrated his birthday on June 22. Keerthy has come up with a painting of Vijay.